On Tuesday and Wednesday, middle school student Axel Clavier led the elementary school in an activity designed to raise awareness in a very visual way. Axel is part of the task force “Inconvenient Youth”, which is part of Al Gore’s climate change initiative. Axel spoke to the elementary school this past fall about global warming in general, and returned this week to promote a “Waste-Free Day” at elementary school lunches. We spread three tarps out in the back to the multipurpose room, one each for compost, recycling, and trash. 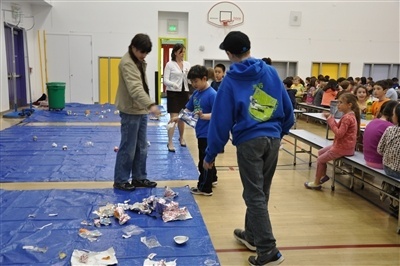 On Tuesday, Axel asked the students to put their waste directly on the tarps. At the end of lunch, he talked about the different kinds of waste, highlighting that while compost might be the best kind of waste, it is still waste, and let’s all try to reduce our waste overall. 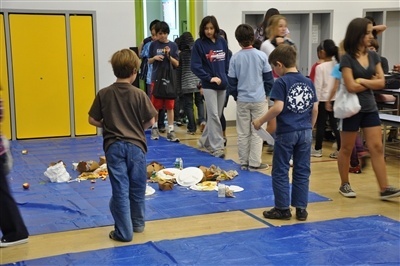 He challenged the elementary school to make Wednesday a “Waste-Free Day” by using reusable packaging, taking only what you can eat, and even thinking about making lunches from more local ingredients. On Wednesday, the tarps were out again and we eagerly awaited the reduction in waste. 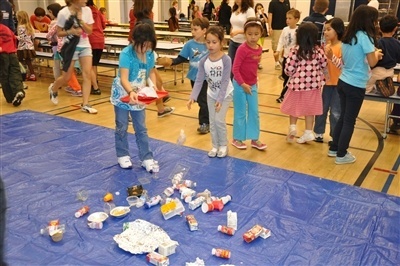 The 1st and 2nd graders reduced their waste significantly, especially in the trash and recycling piles. 3rd-5th also did reduce their waste, though their compost pile increased slightly. Later, at Assembly, Axel summarized the students’ accomplishments and highlighted some lessons learned. 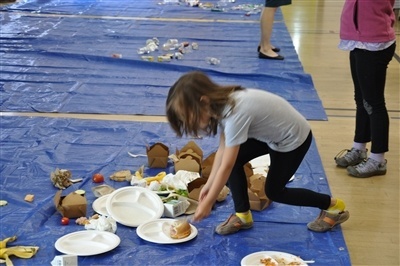 One lesson we learned is that we actually don’t produce as much waste as we thought! We do need reminders about what waste goes in what pile, but for the most part, our students are used to composting and recycling. We did notice that some students don’t even touch a part of their lunch, and that does not need to go to waste – it can be returned to the kitchen or home for another use. We were very encouraged by the amount of students who made a big effort to bring reusable containers and make their lunches truly waste-free. The best part of this exercise was the level of engagement. The entire elementary school was excited to throw their waste on the tarps and see how it piled up. I overheard conversations later in the afternoon, and listened the next day as students talked about their lack of waste with pride. This was a lesson that will stick with our students for some time, and remind them to think a little bit more about their habits. Hopefully it will even ignite some conversations at home and some sparks of passion about being responsible global citizens and stewards of our earth.